Monday 26th September- Dixie air horns for yellow and a makeover for Gertie! During the recent 10CR where I managed to get two punctures, I ended up borrowing somebody else's wheel. The wheel I borrowed was painted in a creamy white and when fitted on my car, I thought it looked much better than the silver TR6 wheels I already had on there. So, one by one I have been rubbing my wheels down and respraying them in 'Rover Leyland White'. I have only managed to do two at present, but I really like the new look. I just need to find the time to do the other three now. The Club Triumph autosolo is taking place this Sunday and for a bit of 'merriment' Dave and I thought that some 'Dixie' air horns would provide a bit of amusement. So with the air horns fitted Saturday, it was Dave's task to sort out the 'electrickery' side of things. Dave arrived about 7.30pm amidst a torrential downpour and promptly proceeded to do his usual thing of stripping suitable bits of wire off of an old wiring loom and throw all the unwanted bits of wire and used black tape all over my recently swept garage floor. After much banter and p*ss taking between us the job was jobbed and a test 'blast' took place. This didn't go too well as all the ignition lights went dim and the amp meter needle nearly broke out through the glass on the gauge! Something not quite right there then! Dave then repositioned some on the wiring on the relay and the high decibel horns then blasted into life and set next doors dog off! Good! I hope it woke the poxy thing up like it does me at six in the morning! Sunday 25th September - Anti vibration attempts continued! With the vibration on Gertie now starting to do my head in, I've started making attempts to eradicate this annoying feature. Its always been on the car, so whatever it is that's causing it, was on the car when I bought it. With this in mind, I've started replacing the bits I've not yet touched. The problem is, I'm not sure where the vibration is coming from. Sometimes, it appears to be from the nearside front, other times it appears to be directly underneath me. So far this weekend I have replaced both front wheel bearings, the gearbox cross member rubber mounting and late Sunday night, the nearside ball joint. I test drove the car after doing the wheels bearings and cross member, but so far this has made no difference. I've yet to test drive it after changing the bottom suspension arm and the ball joint. Sunday 18th to Wednesday 21st September - Post 10CR issues. 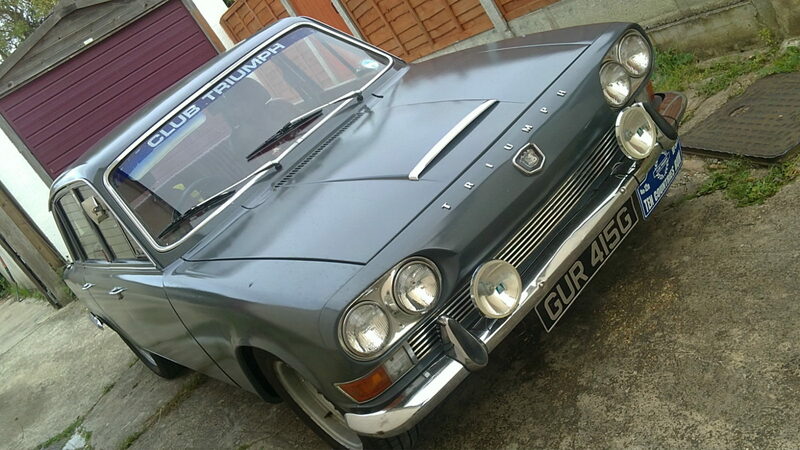 With the recent Club Triumph 10CR now over, I can sort out one or two minor niggles that became evident on the run. The first one was a vibration that starts at about 70 mph and seems to be coming from the front of the car. I removed the propshaft to inspect the universal joints to inspect them and sure enough, the front one did seem to have movement. However, fitting my spare propshaft and taking the car for a test drive showed this not to be the issue as the car was no different at all and the vibration was still there. Back to the drawing board! The steering column bush and the front wheel bearings are the next to be checked. With the hot running engine in mind I also flushed out the radiator and engine block. I flushed this out forwards and backwards to try and get all the crap out. To be honest, not as much came out as I expected, so I may just need to have the radiator re-cored. An electric fan was purchased from ebay so hopefully this will aid cooling as well. Sept 8th 12th- The Club Triumph 10CR finally arrives! A 6.30 grey and bleary September Thursday morning saw me leaving my home town and making the relatively short trip to the start location of the Club Triumph 10CR in Enfield. The 40 minute journey time took me 1 hour and 20 minutes due to the usual crap on the M25, but I still made the start before the 8am deadline. After finding my co-driver, Peter for the event and loading his gear into my car, we set off along with 70 other Triumphs for Dover for our 13.15 Ferry booking. After leaving here we settled in for our night run through more of France, Belgium, Luxembourg and France again before ending up at our next control point at Bartenheim near the Swiss border. We managed to grab a couple of hours sleep here before daylight loomed on Friday morning. We worked our way through the Brunig, Grimsel and Furka passes before stopping at our next control point at the St Gotthard pass. One of the stall holders took exception to me parking where I did and bellowed at me: 'You cannot park here! You must park far away!' I then realised I had parked in the seating area for her food stall! We then covered more alpine passes at St Bernadino, Splugen and Bernina before crossing the border and into Italy and covering the Forcola Di Livigno, Ofen and Umbrail passes. 'Gertie' took a dislike to some of these strenuous climbs and started running hot, so we decided to remove the thermostat in an attempt to make her run cooler. 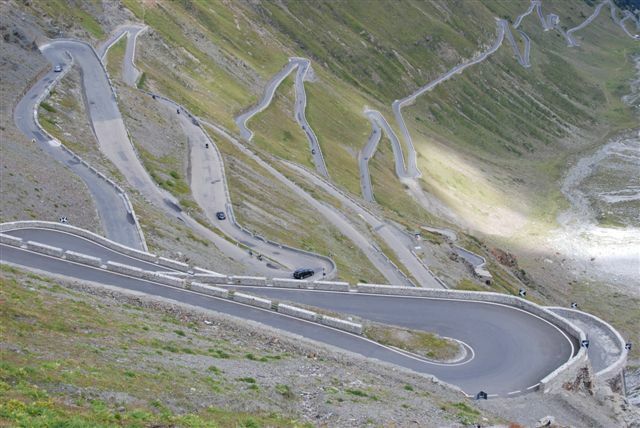 This worked for a while, but on the climb up the 2,758 metre high Stelvio pass the temperature ran into the red. She still made it though and not once did she overheat or boil over. With Stelvio conquered we headed over towards Cavalese and our hotel stop for the night. With very little sleep the night before we were both looking forward to stopping and resting, but fate had other ideas and decided to extend our day even more by proving us with a puncture. In a tunnel! Saturday morning- The start of the day saw us trying to find somewhere to get the tyre repaired, but after finding three tyre places closed and one who was open but wasn't interested, we gave up. Today's task was more alpine passes in Italy, crossing the border into Austria and climbing the 2,509 Metre Timmelsjoch pass, then onto Liechtenstein before entering Germany for our next hotel stop. The scenery was outstanding and the weather was beautiful. Peter managed to get busted by the Austrian police for doing 74kph in a 60kph zone and also managed to get abused by a cyclist that he got too close to! (I think 'Aishole' was the exact expression used!) Perhaps he should have had a can of the below to calm down a bit! With night time falling we pulled into the 'Gastoff Rossle' hotel and once again much merriment and drinking ensued. We'd had another good day and Gertie was behaving herself. Sunday morning- While carrying out general checks on the car I discovered another puncture on the car! Luckily, with our spare already in use, my friend Russell was good enough to lend me his spare. With another wheel change completed we left our start location at Aichstretton and set off for the 450 mile journey through Southern Germany and up to our next stop over in Holland. We stopped for a brief lunch at Pirmasens and then settled in for a stint up to the next control point at Spa in Belgium. We managed encounter some amazing weather on the way up there and its the first time that I have encountered rain and hail at the same time along with thunder, lightning and gales! There was no warning it was coming either. No light rain first, then heavy rain, it was just like driving into a car wash at 70mph! We and all the other cars were reduced to 15mph while waiting for it to clear. At around 6pm in the evening, we finally reached the official finish location at Rolduc in Holland. Rolduc is an old monastery that's been converted into a hotel. A lot of the original monastery is still there and its architecture is outstanding. It's still a popular location with the tourists. The atmosphere was electric and everyone arriving was on a buzz at completing this mammoth journey. It was great to see the majority of cars that started in London all those days ago pulling in with all of their crews and drivers looking so happy. Dinner was enjoyed by all and then the serious drinking started. Old friends were caught up with, stories of breakdowns and issues were exchanged and favourite bits of the run were remembered. All too soon it was early hours of the morning and everyone was retiring ready for the trip home. Monday Morning- Ouch my bloody head! Who's idea was it to move onto Rum? Oh yeah, I remember, it was Peter my co-driver! A hot shower and a breakfast of Scrambled eggs and bacon was the order of the day (it made a change from the meat, cheese and bread diet of Italy and Germany!) before checking out and making the short drive into Belgium before eventually turning up 'the corridor' and heading towards Dunquerkue and then Calais. The news from the ports wasn't good and the storms that had been allegedly battering England all weekend had also affected the sea crossings. With trepidation we booked in at Calais and found that the boat we were booked on was running two hours behind. Still feeling the effects of the night before, I reclined the drivers seat and went to sleep. Sometime in between 4 and 5pm, we boarded our ferry and set sail. (We had arrived at Calais at 12pm) Thinking it wouldn't be long now until we were home, we were dismayed to find that the port of Dover was only letting in one ferry at a time and the boats were queued up outside the sea wall waiting to dock! This lead us to being stuck on the ferry for a further 90 minutes! (Three hours including the crossing time!) Just after 7.30pm, the boat docked and we made a dash for home. I was tired and fed up by now and Gertie was forced to go the fastest she'd been the whole trip reaching my home one hour and twenty minutes after leaving Dover! All in all though, it was an absolutely fantastic trip and apart from the 2 punctures and the warm engine, Gertie ran absolutely faultless. Bring on the next one! The run up to Timmeljoch pass. 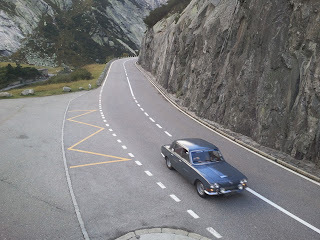 Climbing the Grimsel pass in Switzerland. OMG! 2 days to go!! The parts from Chris Witor arrived today so I went straight into the garage to get them fitted. When I was under the car the other day, (I can't remember why I was under the car - I just was!) I saw that there was very little evidence of any bushes between the gearbox cross member and the floor. The car has a very slight vibration that creeps in at about 75-80 mph. (and if any policeman are reading this, it comes in at 65-70mph!) So I'm wondering if the lack of bushes is what's causing it. With this in mind, new Superflex bushes were purchased and I ventured under the car again to get them fitted. Monday 5th September - Greasing my shafts!! 3 days to go now! I was hoping some parts I had ordered from Chris Witor were going to arrive today, but they didn't. So I decided instead to remove the rear drive shafts and hubs and give them a good greasing. They had been on the car for some time so I thought they were due some attention. To my surprise they were both pretty good and didn't need that much attention. While the back wheels were off of the car I adjusted up the handbrake so there's less chance of the car rolling away and disappearing off a cliff when we stop in the Alps to admire the scenery! Sunday 4th September - Counting down the days! 4 Days left to go until we leave for Europe! Not quite in 'panic' mode, but I do have a few jobs I want to check over before our high mileage trip. The tappets were the first job of the day. I felt they could have been quieter, so a quick adjust with the engine warm was carried out. The next job was to check out the wiring. I had noticed recently that the heater and reversing lights could operate without the ignition being switched on. My trusty mate & co driver Dave was good enough to help me me investigate and we soon realised that some of the wires on the fuse box had been connected to the wrong tabs. With the help of the workshop manual, we soon had the wires in the right place and everything was working as it should again. Perfect! With these jobs sorted out I called it a day and went down to the Triumph 2000 register Essex to meet a few like minded Triumph bods. A good night was had by all and everyone wished me well for the impending adventure! Thursday 1st September. Replacement driveshaft. When driving to and from the recent autosolo in 'old yellow' I noticed quite a severe vibration at around 35 and 70 mph. Now I know it's not the propshaft that's causing it as this was recently balanced, so my suspicions point to the offside rear driveshaft. I did change this before the event, but the spare one I fitted was obviously worn as well. The problem is, the only spare driveshafts I have at the moment are all second hand ones from cars that are long gone. So anything I fit is going to be a gamble. the other problem is that the rear hubs are so difficult to pull apart. I've tried various different hub pullers with no success at all. I need to find someone with a press so I can pull them apart and replace the bearings myself. You can buy reconditioned hubs, but they are around the £200 per time mark! And ideally, I need six of them for my three cars!!!! !